SKF NOTE: Hall Overton arranged two big band dates for Thelonious Monk. Both concerts were recorded and originally released, in part, on vinyl. Thanks to digital technology the entire concerts are available on CD and in MP3 format. 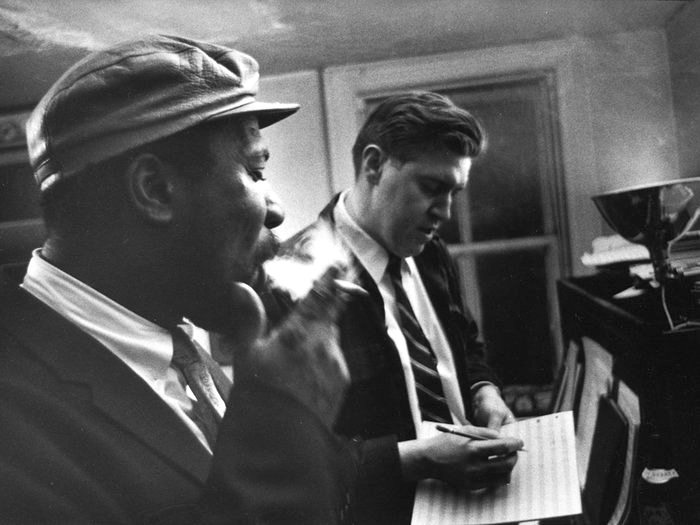 Just a few years ago, someone discovered among photographer Eugene Smith‘s belongings, boxes of photos and tapes that included Overton and Monk rehearsing for these dates. Listen to this NPR story on one of the exciting discoveries in jazz history. I found Mr. Overton’s obituary in a 1972 Down Beat. In chronological order, the concert recordings are, The Thelonious Monk Orchestra at Town Hall with Art Taylor on drums, and Monk Big Band and Quartet in Concert with Frankie Dunlop in the drum chair. This entry was posted in Drum/Music News and tagged Art Taylor, Down Beat, Drummer, Frankie Dunlop, Hall Overton, Obituary, Scott K Fish, Thelonious Monk. Bookmark the permalink.